The Earth app is similar to the Maps app on your Android phone, but with one huge difference: It covers the entire planet. And while you can get around and explore your locale or destination using the Maps app, Earth is more of a look-and-see, interactive world atlas. Your phone may or may not have come with the Earth app. 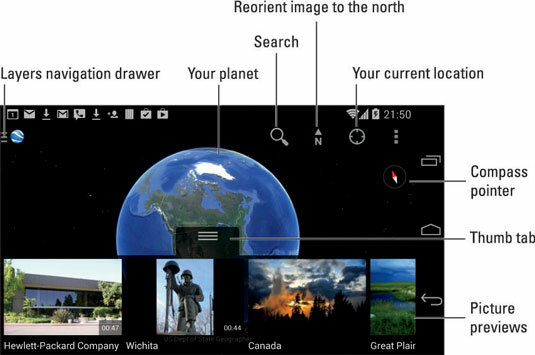 If you don’t find the Earth app in the apps drawer, visit the Google Play Store and download a free copy. If you’re familiar with the Google Earth program on a computer, the Earth app should be familiar to you. Its interface is shown. It has similar features to the Maps app, but it’s customized for viewing the globe. Items in the Layers navigation drawer are used to show or hide map details.